Lately, I’ve not had a lot of time to read. 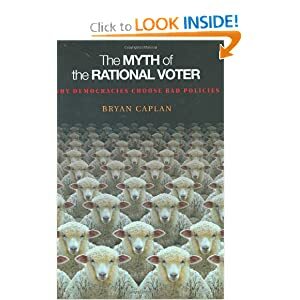 But when I have had time, I’ve enjoyed reading the wonkish and pointed “The Myth of the Rational Voter” by Bryan Caplan. It’s an economist’s look at why, as the sub-title says, voters tend to support bad public policies. The reason, Caplan argues, is not special interests or rampant lobbying, but rather, it is “popular misconceptions, irrational beliefs, and personal biases head by ordinary voters” (from the fly-leaf). What is interesting, as I have barely begun to read it, is the biases that he points out and, to deepen the plot, as it were, is that economists have long seen and known these biases. Antiforeign Bias: “a tendency to underestimate the economic benefits of interaction with foreigners.” (p. 36) Interestingly, Caplan tells in association with this bias of an business associate of his that believes everything wrong with the American economy could be solved with a naval blockade of Japan and a Berlin Wall at the Mexican border…hmmm, I can’t imagine where I’ve heard something like that latter one before. Make-work Bias: “a tendency to underestimate the economic benefits of conserving labor.” (p. 40) In other words, “[w]here noneconomists see the destruction of jobs, economists see the essence of economic growth–the production of more with less.” Not sure how you’d explain that one to the 10% of America who is under or unemployed right now. Pessimistic Bias: “a tendency to overestimate the severity of economic problems and underestimate the recent past, present, and future performance of the economy.” (p. 44) I know one man who must wish this one didn’t exist, and he’s the Cheerleader-in-Chief. The results? People act irrationally while making ballot box decisions, resulting in public policy that is against their interests. Check it out. It’s an interesting read and well worth your time as we move into an election year where the economy really is the only issue. This entry was posted in Elections and tagged Bryan Caplan, Campaigns and Elections, democracy, Economics, Elections, electoral politics, Myth of the Rational Voter, public policy, The Myth of the Rational Voter: Why Democracies Choose Bad Policies, United States. Bookmark the permalink.